Water and flood damage can throw your life into chaos, forcing you to deal with insurance companies, restoring your property, and a host of other stressful issues. Thankfully, you don’t have to deal with those problems on your own. The team at Pro Restoration are experts in water and flood damage restoration, ready to repair residential and commercial properties (if we have a separate page for this) with ease. 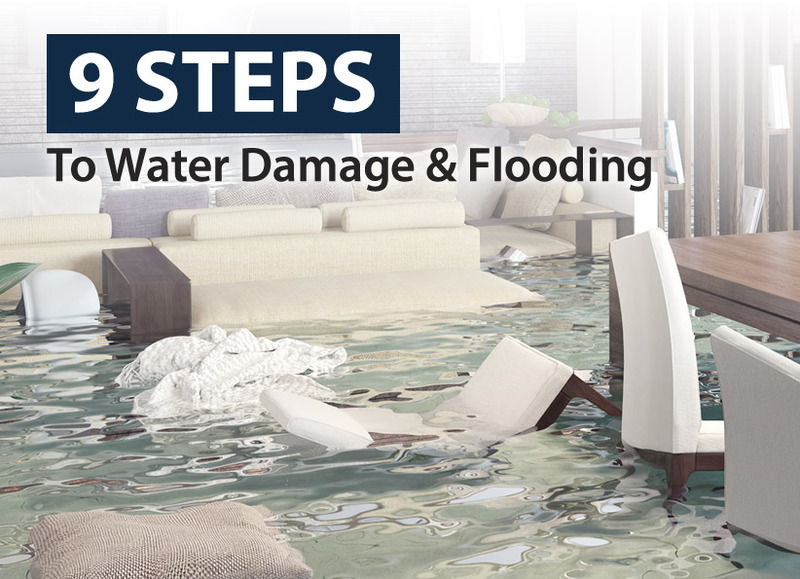 And to help you when flooding strikes, we’ve created a helpful guide on the steps you need to take when water and flood damage strikes. Your first step when confronted with sudden flooding should be to stop water from entering your property. If your flood is caused by something like a burst pipe or water heater, shutting your property’s main water valve should do the trick. To help save your home or business in the event of an emergency, make sure your family or employees know where the shutoff valve is located. That way someone can find it as soon as possible when disaster strikes. After doing what you can to stop your flooding, you should contact a water and flood damage restoration & remediation service to handle the rest of the problem. You’ll need help moving all your water damaged property and surveying the damage for restoration and remodeling needs, something a restoration service can help you with. Luckily, the team at Pro Restoration is here to help. We’re available whenever you need us, with 24/7 emergency services to help you recover from terrible water damage and floods. As we all know, electricity and water can be a deadly combination. That’s why you’ll want to turn off your electricity as soon as possible. To do this, you’ll want to turn off electricity at your main breaker box and unplug electrical appliances near the flooded area. But remember, you should only do these things if you don’t have to step in water or stand on your wet floor to do so. Besides turning off your electricity, you’ll also want to put plugs in your toilets, showers, sinks, or other drains to prevent sewer back-up. And do not turn on your heating or air condition systems, as they can potentially spread bacteria or mold often associated with water damage. This should go without saying, but it’s important to remember that you should not use electrical appliances when experiencing water and flood damage. An influx of water means an increased chance of electrocution, so you’ll want to avoid using electrical appliances or approaching any electrical wiring or chords near the flooded area. If flooding is contained to a small or localized area, then you should try to prevent further damage by mopping up water or containing the water with towels. However, if you suspect you’re having sewage backflows, you should leave the water alone. You don’t want to spread bacteria around your property — leave that clean-up to the professionals. Water can do some serious damage to your property, and you’ll want to get your belongings to dry areas as soon as possible. Be sure to move big belongings and valuables as soon as you can, that way they can be restored after your water damage is cleared up. After experiencing a flood or major water damage, you’ll want to file an insurance claim. The claims process can be tedious, and as such you’ll want to get it started as soon as possible. If you need help with the insurance process, you’re in luck, because Pro Restoration’s team knows how to deal with insurance companies. Our experts can guide you through the entire claims process, making sure you receive the compensation you deserve after your damages. You might be tempted to purge your belongings after major damage, but don’t act so fast. An insurance claims adjuster may need to inspect your belongings as part of their investigation. Moreover, our restoration experts may be able to repair your damaged property. Let Pro Restoration’s team help you decide which items are trash and which can be restored. The water from your flood could contain harmful bacteria and sewage. As such, it’s important to remember to wash your hands and clothes, keeping yourself clean and preventing the spread of harmful bacteria. Water and flood damage can cause a massive headache. But if you stay calm, tackle the issue head-on, and get the help from a professional restoration service, everything will be fine. If you’re looking for residential and commercial restoration services in Las Vegas, Henderson, or Clark County, consider Pro Restoration. Our experts are ready to handle water and flood damage, fire and smoke damage, mold remediation, and much more. For more information on our services, contact Pro Restoration today. Stop Mold At Work Before It Gets Out Of Hand!